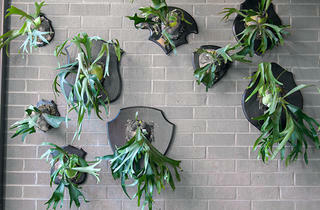 Heather Shouse tells us an easy to re-create her antler-esque plant installation. The menu at Carriage House (1700 W Division St, 773-384-9700) finds its roots in the shores of South Carolina, but that’s not the only thing you’ll find inspired by the South at this Wicker Park restaurant. 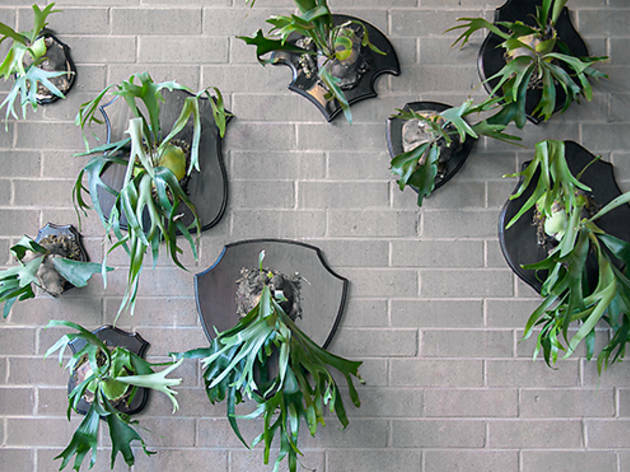 The antler-esque plant installation designed by TOC senior Food and Drink correspondent Heather Shouse in Carriage House’s recently enclosed porch is a unique take on traditional taxidermy, using staghorn ferns instead of antlers. “I love taxidermy,” says Shouse, who creates botanical installations in homes and business with her company, Bottle & Branch. “But I’m just trying to find new ways to freshen up something that I think has become a little played out.” Indigenous to the South, the ferns can thrive in Chicago, and Shouse says you don’t have to be a botanist to take care of them. To create the displays, Shouse custom-made different-shaped plaques and stained them with black Minwax, available at the Home Depot or Menards. You can find your own plaque by searching the wide selection on eBay or look for one at thrift stores. Scuff up the center of the wood with sandpaper to give the ferns’ roots something to adhere to, and turn four tiny screws in a square shape around the scuffed area. Cover the fern’s roots with a small ball of sphagnum moss, available at Home Depot, then place the moss ball on top of the scuffed area (which should only be as large as the moss ball). Thread fishing line through the roots and around the screws to secure the fern to the plaque. After a couple of weeks, the roots will latch on. The project should take around 20 minutes and can be done for around $100 with a medium-size fern (If you’re feeling lazy, they’re also available by order at Sprout Home) and plaque. (You can also order one at the Bottle & Branch website. Prices vary according to size and quantity.) Once finished, be sure to keep in mind where you store the plant. Shouse placed these ferns on the porch for a reason: “They like brighter, indirect light,” she says. And watering them is easy. Submerge the wood base and root ball in a full sink for two or three minutes once a week.